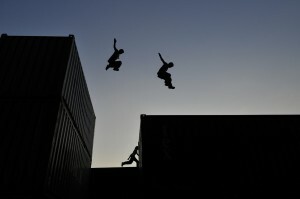 Only one thing matters in the lives of Richie, Nonne and Paule: parkour. They spend most of their spare time together practicing this sensational sport. However, their close friendship is about to fall apart when Nonne starts spending more and more time with Hannah, Richie’s girlfriend. Richie’s life disintegrates even further when one of his workmates has a terrible accident at the building site they work on. Hannah is distancing herself from Richie and his closest friends seem to be playing a double game. Richie is getting entangled in a web of mistrust, jealousy and violence. What makes things worse is that his workmate – the accident victim – appears on the scene, trying to find out how the accident really happened. Nimble Richie is breaking through all obstacles on the parkour, but he still has difficulties overcoming the obstacles in his life. This vibrant movie displays the elegance of a truly unique sport. Marc Rensing was born in Gronau in 1974 and studied at the Filmakademie Baden-Württemberg from 1998-2005. A selection of his films includes: DIE SCHALLMAUER (1996), WEILANDS LETZTE FAHRT (1999), DIE WELT RETTEN (1999), FRÜHER SIND DIE HIER NOCH GEFLOGEN (2000), WILKOMMEN IN WALHALLA (2001), ALLES IN ORDNUNG (2004), PARKOUR (2009), and THE WOMAN WHO DARES (DIE FRAU DIE SICH TRAUT, 2013).